44 Commercial Real Estate & Properties in Winnellie are listed in 3 categories. We have 37 Industrial Warehouses Sale , 9 OfficesSale and 1 Retail ShopsSale . bull; Unit building area 97m2 bull; Security fenced rear yard area 39m2 bull; Masonry block construction bull; Internal height including windows allows for future mezzanine bull; Combined shower W.C and kitchenette bull; Motorized roller door front, manual operation at rear bull; Car parks + loading bay area on title bull; Development complete and available to Occupy Located in new complex of 40 Small to medium warehouse units in sought after Winnellie.. View by Appointment 7 Days! For Sale: $225,000 + GST For more information, or to arrange an inspection, call Nick Syrimi today on 0412 537 638 at Ray White Commercial (NT) Visit our website rwcnt.com.au to view all our property listings! Unit building area 68 m2 Masonry block construction Internal height allows for future mezzanine Combined shower W.C and kitchenette Motorised roller door 1 car park + loading bay area on title Development complete and units available to occupy Located in new complex of 40 Small to medium warehouse units in sought after Winnellie. View by Appointment 7 Days! For Sale: $150,000 + GST For more information, or to arrange an inspection, call Nick Syrimi today on 0412 537 638 at Ray White Commercial (NT) Visit our website rwcnt.com.au to view all our property listings! Unit building area 68 m2 Masonry block construction Internal height allows for future mezzanine Combined shower WC and kitchenette Motorised roller door 1 car park + loading bay area on title Development complete and units available to occupy Located in new complex of 40 Small to medium warehouse units in sought after Winnellie. View by Appointment 7 Days! For Sale: $150,000.00 + GST For more information, or to arrange an inspection, call Nick Syrimi today on 0412 537 638 at Ray White Commercial (NT) Visit our website rwcnt.com.au to view all our property listings! Unit building area 62 m2 Masonry block construction Internal height allows for future mezzanine Combined shower WC and kitchenette Motorised roller door 1x car park + loading bay area on title Development complete and units available to Occupy Located in new complex of 40 Small to medium warehouse units in sought after Winnellie. View by Appointment 7 Days! For Sale: $135,000 + GST For more information, or to arrange an inspection, call Nick Syrimi today on 0412 537 638 at Ray White Commercial (NT) Visit our website rwcnt.com.au to view all our property listings! Unit building area 79 m2 Masonry block construction Combined shower W.C and kitchenette Motorized roller door 2 car parks + loading bay area on title Development complete and units available to occupy Located in new complex of 40 Small to medium warehouse units in sought after Winnellie. View by Appointment 7 Days! For Sale: $175,000 + GST For more information, or to arrange an inspection, call Nick Syrimi today on 0412 537 638 at Ray White Commercial (NT) Visit our website rwcnt.com.au to view all our property listings! Unit building area approx. 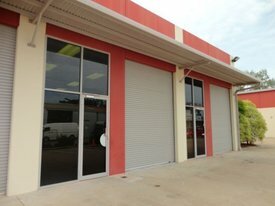 18.5 m2 Masonry block construction Roller door access to unit Clean, tidy and presents as new Secure remote gate access to complex 24 hrs Caretaker on premises Vacant and available to occupy now Only six minutes drive from the Darwin CBD Council Rates: $350 per annum View by Appointment 7 Days! For Sale: $43,000.00 excluding GST For more information, or to arrange an inspection, call Nick Syrimi today at Ray White Commercial (NT) Visit our website rwcnt.com.au to view all our property listings! Stand Alone Strata Office/commercial Unit $298,000 (GST not applica..
Shop area 75 m2 and front verandah area of 25 m2 Car parking directly in front of the premises Vacant possession Please note: the property is no longer set up as a takeaway/food catering outlet. View by Appointment 7 Days! For Sale: $298,000 GST excluded For more information, or to arrange an inspection, call Nick Syrimi today at Ray White Commercial (NT) Visit our website rwcnt.com.au to view all our property listings! Unit building area 79 m2 Masonry block construction Internal height allows for future mezzanine Combined shower W.C and kitchenette Motorised roller door 2 car park + loading bay area on title Development complete and units available to Occupy Located in new complex of 40 Small to medium warehouse units in sought after Winnellie. View by Appointment 7 Days! For Lease: $175,000.00 + GST per month For more information, or to arrange an inspection, call Nick Syrimi today at Ray White Commercial (NT) Visit our website rwcnt.com.au to view all our property listings! Small warehouse with office Warehouse 44 m2 in building area Office area amenities area approx. 20 m2 Storage area approx. 24 m2 Combined shower and W.C Kitchenette Wide motorised roller door 1 car park on title View by Appointment 7 Days! For Sale: $110,000 + GST For more information, or to arrange an inspection, call Nick Syrimi today at Ray White Commercial (NT) Visit our website rwcnt.com.au to view all our property listings! Neat and Clean and ready for you to just move straight in. 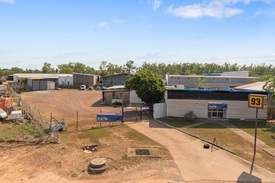 This 190 m2 approx warehouse / showroom offers your an incredible space within a modern industrial complex built of quality construction within Darwin's prime industrial location of Winnellie. Sure to be enticing, this property provides exceptional clear span height throughout, an attractive glass facade or display window, as well as internal amenities with showers and complete with on site parking within the complex. Front Unit with Great Signage Opportunity. Well located and ultra secure, this large lockup storage unit is located in the 'Winnellie U Store It' complex of units. Store your documents, vehicle, boat or recreational gear, or lease out as a low risk, low maintenance investment... A quality commercial investment at this price is an opportunity not to be missed!! Call Today. Ground floor unit Modern Commercial Building Unit building area approx. 119 m2 Amenities include kitchenette and W.C Excellent outlook presentation Front office area open plan area 50 m2 fully air conditioned Glazed shopfront Carpet floor coverings Storage area approx. 69 m2 Motorised roller door access from the car park 2x car parks on title Free parking across the road on Coonawarra Rd Commercial Lease in place Rent income $30,233.16 + GST per annum plus 100% outgoings View by Appointment 7 Days! For Sale: $357,000 + GST For more information, or to arrange an inspection, call Nick Syrimi today at Ray White Commercial (NT) Visit our website rwcnt.com.au to view all our property listings! Located in a recently new complex of 40 Small to medium warehouse units in sought after Winnellie Unit building area 81 m2 Masonry block construction Internal height allows for future mezzanine Combined shower W.C and kitchenette Motorised roller door Painted walls throughout colour white 2 car parks loading bay area on title Excellent truck and vehicle access Available for immediate occupancy View by Appointment 7 Days! For Sale: $175,000 + GST For more information, or to arrange an inspection, call Nick Syrimi today at Ray White Commercial (NT) Visit our website rwcnt.com.au to view all our property listings! Offering affordable space for the owner operator, small business or simply space for personal storage Small to medium warehouse units in sought after Winnellie Various building areas 62m2, 68m2, 79m2 97m2 Larger units have fenced areas Masonry block construction Internal height allows for future mezzanine Combined shower W.C and kitchenette Motorized roller doors Car parks on title Development complete and ready to occupy For Sale: $150,000 $225,000 + GST View by Appointment 7 Days! For more information, or to arrange an inspection, call Nick Syrimi today at Ray White Commercial (NT) Visit our website rwcnt.com.au to view all our property listings! Warehouse with office Masonry block construction Total Warehouse area ground level 214 m2 Includes front office area approx. 14 m2 Kitchenette Bathroom shower + W.C combined Mezzanine level: Storage area approx. 92 m2, Air conditioned room area approx. 41 m2, Kitchenette Wide roller door Brick paved car parking area and driveway Available for immediate occupancy Located at the City end of Winnellie minutes from the CBD View by Appointment 7 Days! For Sale: $418,000.00 + GST For more information, or to arrange an inspection, call Nick Syrimi today at Ray White Commercial (NT) Visit our website rwcnt.com.au to view all our property listings! First floor strata office unit Unit building area 64 m² Full height glazing Amenities include kitchenette and toilet 1 car park for this tenancy Visitor car parks for the complex Plenty of free angle parking across the road also Modern Commercial Complex Excellent outlook presentation Fitted out with carpet floor coverings, ducted channel around the perimeter with power points and phone data points installed View by Appointment 7 Days! For Sale: $193,500 + GST For more information, or to arrange an inspection, call Nick Syrimi today at Ray White Commercial (NT) Visit our website rwcnt.com.au to view all our property listings! View by Appointment 7 Days! For Sale: $215,000 + GST For more information, or to arrange an inspection, call Nick Syrimi today at Ray White Commercial (NT) Visit our website rwcnt.com.au to view all our property listings! Located in a recently new complex of 40 Small to medium warehouse units in sought after Winnellie... Unit building area 81 m2 Masonry block construction Internal height allows for future mezzanine Combined shower WC and kitchenette Motorised roller door Painted walls throughout colour white 2 Car parks loading bay area on title Excellent truck and vehicle access Available for immediate occupancy View by Appointment 7 Days! For Sale: $180,000 + GST For more information, or to arrange an inspection, call Nick Syrimi today at Ray White Commercial (NT) Visit our website rwcnt.com.au to view all our property listings! Located in new complex of 40 small to medium warehouse units in sought after Winnellie.. bull; Unit building area 97 m2 bull; Security fenced rear yard area 39 m2 bull; Masonry block construction bull; Internal height including windows allows for future mezzanine bull; Combined shower WC and kitchenette bull; Motorized roller door front, manual operation at rear bull; Car parks + loading bay area on title bull; Development complete and available to occupy View by Appointment 7 Days! For Sale: $225,000 + GST For more information, or to arrange an inspection, call Nick Syrimi today on 0412 537 638 at Ray White Commercial (NT) Visit our website rwcnt.com.au to view all our property listings! Property features: Double story house plus workshop Ground level Two bedrooms, lounge, kitchen, laundry First level Two bedrooms, lounge, kitchen, laundry Workshop area approx. 160 m2 Security fenced around the perimeter Ground level area easily converted to office space as may be required Suit Tourist operator, Automotive business Mechanical/detailing Area under title is 1080 square metres Zoning GI General Industry To be sold as vacant possession View by Appointment 7 Days! THIS PROPERTY HAS BEEN LEASED BY RAY WHITE COMMERCIAL (NT) For more information, or to arrange an inspection, call Nick Syrimi today at Ray White Commercial (NT) Visit our website rwcnt.com.au to view all our property listings! Why rent when you can own it your self. This store shed is 6m x 3m and is part of a fully secured storage facility. Great place to securely store valuable tools and equipment as opposed to being in the yard exposed to the elements and those with wrong intentions! Alternatively it can be part of the rental pool and be an affordable investment! Call today for more information. This modern office/industrial property offers an incredible chance to own a sleek, stylish investment within a central location, at an extremely reasonable price. Set in a small complex of tidy units it offers good accessibility and parking on site. Internally, the space is split into two large, open plan air conditioned areas, which are both fully tiled, and features internal kitchenette and bathroom facilities with showers. Currently leased until 31 March 2020, and with annual rent of $19,620pa it shows a return of 6.3%. Contact Martin Gore 0417 850 933 to inspect today. Office / Warehouse in exceptional position. Located in an iconic complex with entry on the city end of Winnellie is a neat 150m² office / warehouse. Lots of passing trade and flanked by popular small businesses with plenty of off street parking. It is big enough but still manageable enough to expand your small business or start and do your own thing. Buying this with your super could offer strong returns at current market leasing rates. For more information or to organise an inspection, please contact the Agent or Email: darwin@ljhc.com.au. Well located and ultra secure, these large lockup storage units have shown tremendous capital growth in recent years, and offer a guaranteed income stream, or the opportunity to occupy yourself. 2 units available buy one or both one for you to use and one for investment! Store your documents, vehicle, boat or recreational gear... A quality affordable commercial investment at this price is an opportunity not to be missed!! Contact Martin Gore 0417 850 933 or mgore@dwn.mcgees.com.au to inspect today .